Escaped Germline soldiers need to be cleaned up, and Stan Resnick is the best man for the job. A job that takes him to every dark spot and every rat hole he can find. Operatives from China and Unified Korea are gathering escaped or stolen Russian and American genetics, and there are reports of new biological nightmares: half-human things, bred to live their entire lives encased in powered armor suits. Stan fights to keep himself alive and out of prison while he attempts to capture a genetic, one who will be able to tell him everything he needs to know about an newer threat, the one called "Project Sunshine." 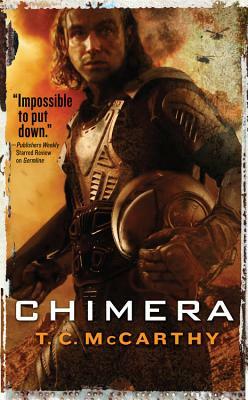 Chimera is the third and final volume of The Subterrene War Trilogy, which tells the story of a single war from the perspective of three different combatants. The first two volumes, GERMLINE and EXOGENE, are available now. T.C. McCarthy earned a B.A. from the University of Virginia, and a PhD from the University of Georgia, before embarking on a career that gave him a unique perspective as a science fiction author. From his time as a patent examiner in complex biotechnology, to his tenure with the Central Intelligence Agency, T.C. has studied and analyzed foreign militaries and weapons systems. T.C. was at the CIA during the September 11 terrorist attacks, and was still there when US forces invaded Afghanistan and Iraq, allowing him to experience warfare from the perspective of an analyst.